We’ve spent a lot of electronic ink telling you to avoid low-cost color laser printers, because they’re all slow, with sparse features, and worst of all, really expensive toner. We’d almost advise the same about the $280 (as of March 25, 2013) Dell C1760nw color laser-class printer (it uses LED technology), but it has one thing going for it: impressive graphics quality, which is challenging to find on any office color laser printer at any price point. Choose this one above the rest, if you must, but you might also want to check out the faster, far more economical, office-class inkjets that we’ve seen from Epson and HP. The C1760nw's two-line LCD display and control buttons are minimal, but effective. The menu structure is nicely laid out, making options easy to find. A blue light directly above the controls indicates the status of Wi-Fi connections. You can also manage the printer via Wi-Fi or Ethernet using the unit's HTML configuration interface. In addition to the PC and Mac drivers, the C1760nw offers remote-printing features, including printing from mobile devices and via email. As with most low-cost color lasers, paper-handling features on the C1760nw are sparse. The front face folds down to create a 150-sheet, open-faced input tray on the bottom of the unit. A 10-page, removable bypass tray sits directly on top of it. The bypass tray allows you to print envelopes and other one-offs without unloading and reloading that main tray, as required with the single-tray C1660w. The output bin integrated into the top of the unit holds 100 sheets. The C1760nw lacks automatic two-side printing (duplexing), however, onscreen prompts walk you through the manual process. You can easily reach most of the paper path for clearing paper jams by folding down the panel on the back of the unit, and the toner cartridges are accessed via a panel on the right side of the unit. 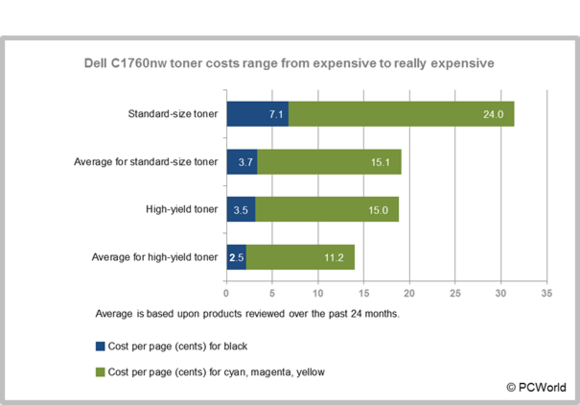 Though cheaper than the C1660w's, the C1760nw's toner is still no bargain. The 3.5 cents you'll pay per black page is around the average for entry-level inkjets, but the additional 5 cents for each additional color is high. Black toner is sold in $70, 2000-page units and the 1400-page cyan, magenta, and yellow cartridges cost $70 each as well. Those are the high-capacity supplies. Dell also sells the 700-page cartridges the C1760nw ships with, but unless you want to pay over 7 cents per page (cpp) for black pages and over 8 cents per color, we recommend against them. While adding color to a C1760nw page is expensive, it's definitely worth it. Color graphics and photos look far better than what we’ve normally seen from an inexpensive, laser-class printer. Text is outstandingly sharp, and black areas are smooth and uniform, if a tad lighter than we'd like. The C1760nw posted average to slow time in our speed tests, using the ethernet connection. Full-page (letter-size) photos print to laser glossy paper at 1.5 pages per minute (ppm). Smaller, snapshot-sized (4- by-6-inch) photos print at 1.8 ppm to plain paper and just under 1.46 ppm to glossy laser stock. Black text and mixed pages of black text and monochrome graphics print at an aggregate 8 on the PC and 8.2 on the Mac. The C1760w carries a one-year warranty with easy exchange. You can pump that up to five years with exchange for $80, and on-site service is also available. The drum/fuser is a lifetime unit, and those support options are reassuring when no replacement is readily available. Dell quotes a 30,000-page duty cycle, but in real life this is about a 500-page-a-month unit. Even if the unit can handle heavier use, print more than 500 pages and the price of the toner will start catching up to you. Color laser devotees, we know you’re out there. If you must buy a low-cost color laser, the Dell C1760nw is one we’re willing to recommend--albeit with many reservations--because of its unusually good graphics quality.